The BBA study for the custom milling option was positive and identified several processing plants able to provide the service. 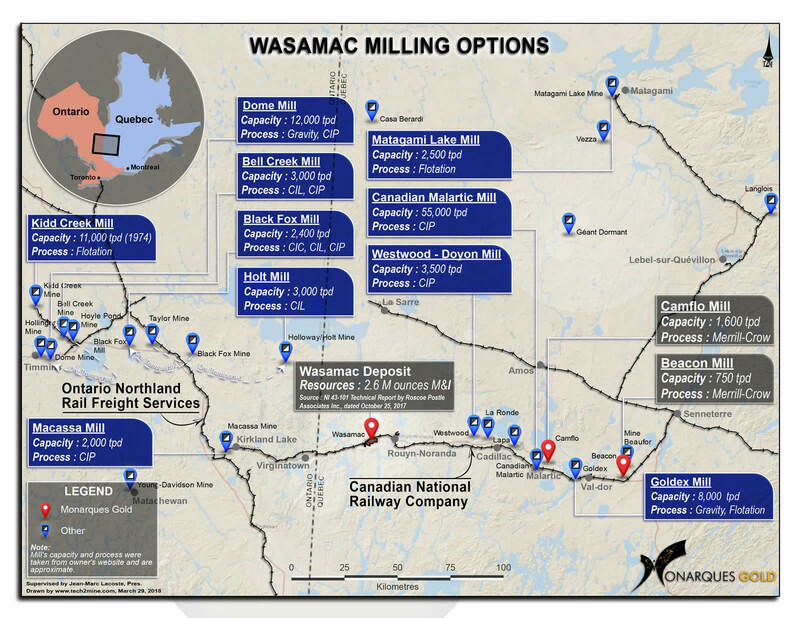 Based on those results, the Corporation has retained BBA to conduct a feasibility study whose base scenario includes a mill and tailings facility near Wasamac, which will also allow to better assess the custom milling option. The goal is to maximize the value of the Wasamac deposit, which contains a measured and indicated resource of 2,587,900 ounces of gold, and to bring it into production at the lowest possible cost. Montreal, Quebec, Canada, May 31, 2018 – MONARQUES GOLD CORPORATION (“Monarques” or the “Corporation”) (TSX-V:MQR) (OTCMKTS:MRQRF) (FRANKFURT:MR7) is pleased to announce that it has retained BBA to conduct a feasibility study for its Wasamac gold project. The study will cover the assessment, design, engineering and costing of the mine, mill, tailings management facility and all related services and infrastructure needed to develop and mine the Wasamac deposit. This new feasibility study will be based on an upgraded measured and indicated resource of 2,587,900 ounces of gold (see press release of October 26, 2017). Monarques management’s priority is to examine every possible way of making Wasamac profitable at a gold price significantly lower than the scenario contemplated by the previous owner. The feasibility study will therefore consider the option of hauling the mineralized material underground to the vicinity of the rail line using the Rail-Veyor transport system, a promising technology currently in use at Agnico Eagle’s Goldex operation in Val-d’Or (see a Goldex Rail-Veyor system), which would eliminate the significant capital expenditures required to sink a shaft. The Corporation expects to receive the results of the feasibility study by the end of 2018. The technical and scientific content of this press release has been reviewed and approved by Marc-André Lavergne, P.Eng., the Corporation’s qualified person under National Instrument 43101. Monarques Gold Corporation (TSX.V:MQR) is an emerging gold producer focused on pursuing growth through its large portfolio of high-quality projects in the Abitibi mining camp in Quebec, Canada. The Corporation currently owns close to 300 km² of gold properties (see map), including the Beaufor Mine, the Croinor Gold (see video), Wasamac, McKenzie Break and Swanson advanced projects, and the Camflo and Beacon mills, as well as six promising exploration projects. It also offers custom milling services out of its 1,600 tonne-per-day Camflo mill. Monarques enjoys a strong financial position and has more than 150 skilled employees who oversee its operating, development and exploration activities. BBA is a Canada-wide consulting engineering firm that offers multidisciplinary consulting services in engineering, project management and environment. Thanks to its cutting-edge expertise in the energy, mining and metals, biofuels, and oil and gas sectors, BBA is now recognized for the excellence of its services, from pre-study to onsite commissioning support and detailed engineering. The firm relies on a team of over 750 professionals from its 11 offices across Canada to carry out local, national and international mandates, thereby helping its industrial clients implement the most reliable, profitable and eco-friendly solutions.